The genus name, Aloysia, was given in honor of Maria Luisa Teresa di Parma (1751-1819), the wife of Spain's King Charles IV. The species name, citriodora, derives from the Latin citrus, a name for citrus fruits, in reference to the plant's lemony scent. A perennial native to the South, lemon verbena has pale green, fragrant, lanceolate, 3- to 4-inch-long leaves arranged in threes. The leaves have parallel veins at right angles to the midrib. The flowers are pale purple and grow in terminal panicles. The plant prefers full sun, moderate to large amounts of water, and light, well-drained, alkaline soil. 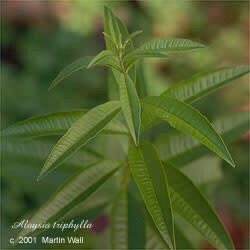 Lemon verbena clears heat, relaxes the nerves, and fights infection. It is used in the treatment of asthma, colds, diarrhea, dyspepsia, fever, flatulence, flu, heart palpitations, indigestion, menstrual cramps, migraines, neuralgia, nausea, restlessness, sinus congestion, stomachache, and vertigo. Topically, it makes a refreshing lemon-scented bath herb, and it can be used as a compress to treat puffy eyes or as a gargle for sore throats and tonsillitis. Lemon verbena is used as a culinary herb. It has a lemony aroma and flavor, stronger and sweeter than that of lemon balm, with a hint of vanilla in the taste. Lemon verbena tea sweetened and served iced is popular in Spain. It is also lovely with the addition of mint. Lemon verbena is popular in potpourris, as its leaves have a long-lasting scent. The essential oil is used to scent soaps, bath oils, cosmetics, and perfumes and to repel aphids, mosquitoes, and mites. Large or prolonged dosages can irritate the digestive tract.